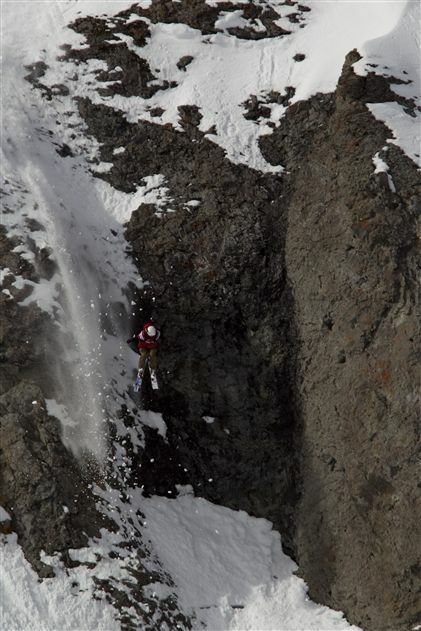 The organisers of the Freeride World Tour, into its 4th year, have recently announced some big changes for 2011. This blog is about how these changes might affect female ski and snowboard competitors. Previously, male and female competitors participated on the tour stops together, skiing or riding the same venues, with the exception of the finals in Verbier. For 2011, female competitions will be integrated within Freeride World Qualifier (FWQ) events, with the final in Verbier as in previous years. The FWQ events, totalling 14 ski and snowboard events held mostly in Europe, were created to give the next generation of freeriders the opportunity to qualify for the FWT and compete with the world’s elite. So for next year, the women will be fighting it out for points in the FWQ events to decide the undisputed Freeride World Tour Champion. Should this really be seen as a step backwards for the women as the first online reactions of the female riders have shown? On the positive side, the level of women’s competition will increase due to the larger numbers of female competitors allowed to start at any one event. In the final at Verbier 2010, 23 male skiers competed compared to 7 female skiers. A larger female starting field will progress the sport. Furthermore, there will still be an undisputed female Freeride World Tour Champion at the end of the season, which apparently, is the whole point. On the negative side, the women may yet again be marginalised at FWQ events as male competitors are given priority on a competition and media level. There will likely also be financial implications for the women. Whereas competitors are payed to start at the FWT events, the FWQ events have no such financial support. If competitors can’t afford to do as many FWQ events as others, it puts them at a disadvantage (NB: the top 3 results of an unlimited amount of FWQ11 events will determine which riders are qualified for the finals in Verbier). The role of the women in the Freeride World Tour previously has been insignificant. Media interest has primarily focussed on the men’s competitions. The highly expensive cineflexx camera for example, operated from a helicopter, was reserved for filming the men only at the FWT stop in Chamonix. Furthermore, the Eurosport 26 minute highlights of each FWT stop covered men’s competition only, never even mentioning that women were also competing. One must conclude therefore that the women, on a business level, don’t add any additional value to the FWT events so long as they are thrown in with the men. In this constellation, the men are the show, and it’s not doing the women any favours to have them tagging along. The solution is a separate world tour for the women, such as the Sony Ericsson WTA Tour in women’s professional tennis or the ASP Women’s World Tour in professional surfing. Separating the women from the men allows the creation of an entirely new product which becomes attractive to a new group of sponsors wishing to advocate their women’s line or products. Such an event can be furthermore geared to women’s specific media. On a competition level, the venues and judging can be designed to progress women’s big mountain skiing and riding to the highest degree. It seems that FWT management is heading in the right direction. The organisers state that “female competitions will be featured (in 2011) within their own media showcase with on-line video features and a specific 26 minutes highlights show”. Finally, I think it’s very important to appreciate what the FWT organisers have done so far for the sport in regards to making it more professional, especially in the eyes of the media. It’s by no means an easy job to do. The female competitors have worked hard to represent the sport well, and together we can make the FWT even better in future. 2011 – equal opportunity!!! the FWT women’s competition needs to equal what the men have available to their comp. the woman are taking as much risk and having to cover equal expenses to compete as the men. the end result is not equal. not fair jan!!! The primary down side I see to this change is the possibility of not having the deserved coverage if the media is forced to budget for men/women’s competition. The increase in women participants is most definitely an upside. I’ll be paying attention to how this unfolds. I think for the most it s a good idea. There definitely needs to be more woman competing. Having only 7 woman at the finals in Verbier is kind of ridiculous. Hopefully the new changes will encourage more woman to compete and to get the media recognition and finacial backing they deserve! However it is a shame to have to split this event between woman and men and not to be able to compete and celebrate together. The Women brought to the FWT10 incredible moments that left no doubt about the awesome progression of female skiing and the interests it develops for media. Jackie’s run in Squaw made us tremble, hold our breath and explode in joy (twice actually, one after each bump) and the runs of many other newcomer ladies like Julia or Ingrid gave the tour an extra thing. I finished my Squaw tv piece with Jackie, cause I couldn’t think of anyone else, boy or girl, better for the show. It was an honour for me! I also carried a special piece on Julia in Verbier that doubled the “on air” time for the FWT for the final on Euronews, the European CNN, the biggest news channel in Europe. If this is a step to increase competition in the women’s arena and create a nice, evolutive and homogeneous women ranking for the season after, then it seems like a good move. If not, then thumb down. Although I am pretty sure it’s a move forward. The FWT people care about the sport and about their athletes, women or men. One thing for sure: we are going to miss you all! Thanks for your contribution people! Nacho: I agree with you, I believe generally this is heading in the right direction, there had to be a change to how the FWT was run previously in regards to the women. And if there is a bigger starter field, it is a big plus! I think that this FWT decision can help the women by building up from a larger pool. Initially this looks like a slap in the face, but it can be a blessing in disguise. The lack of FWT events in North America have, in my mind, hurt the ladies events more than the men. This problem has essentially been eliminated. thanks for your comment eric. the point is that a seperate WT for the women would generate an entirely new pool of potential sponsors. it wouldn’t meant that the existing sponsors need to fork out more funds, which I also believe isn’t realistic. I think this is a positive move for womens freeride skiing. Women cannot compete on the same level as men, as with football, rugby etc That does NOT mean that they are not skiing at an incredibly high level and are improving and reaching new levels every year. Seeing women ski a run after men makes them look bad, it is a simple fact, generally the viewer does not appreciate how technical the line is or how difficult the conditions are. The women are skiing much slower and not taking such big air, this does not make interesting TV or help manufacturers sell equipment. Freeride skiing has a very small following and the footage must be fast, furious and interesting to grab the publics interest and boost the image of the sport. Having women ski separately will allow a greater number of skiers to take part, this is fantastic. I don’t believe that the skiers who are competing are the best in the world, they are just lucky enough to be able to afford not to work and travel around skiing. There is so much untapped talent out there who are put off by the closed door, elitist attitude if the FWT. Having to have a ref from a WT competitor???? Not everyone skis with FWT skiers on a regular basis, or has a camera crew or photographer to provide the images required to gain entry into the elusive FWT qualifiers. This is NOT the way to encourage women to take part. Great skiers ski for the love of the sport and the pull of the mountains, they will not be bothered with all the red tape involved in these competitions, entry must be made simpler. More small comps with open entries to try and encourage new talent. More competitors = better competition = higher standard of skiing. Some very good points here, thanks Mary!